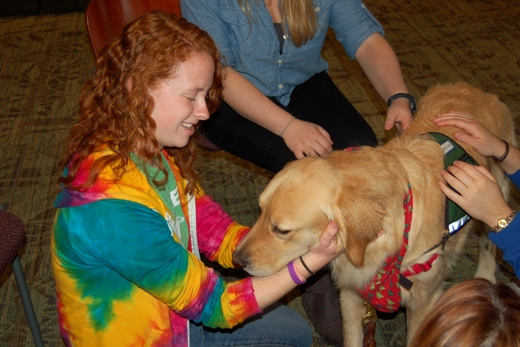 Service dogs come to Woodruff Library Dec. 11-12 to help students de-stress while studying for final exams. Emory University students are invited to take a break from final exam stress this semester for a pet therapy study break on Wednesday, Dec. 11 and Thursday, Dec. 12 in the Robert W. Woodruff Library. Canine Assistants, a nonprofit organization that provides service dogs to children and adults with physical disabilities, seizure disorders or other special needs, will provide trained dogs for students to play with. Students in groups of three will be given 10 minutes to play with the pooches. "A lot of students have animals at home that they miss," says Erin Mooney, the library's outreach and education librarian. "This way, they get the opportunity to pet a dog." Dogs will be available from 10 a.m. to 4 p.m. both days in the Jones Room. This year, there is an opportunity to sign up online for a few spots in advance, although walk-ins are welcome as well. Woodruff Library's outreach and education team is hosting the event as part of its overall initiative to provide study breaks for students and give them a way to relieve stress during exam times. In the past, the library team has sponsored "build your own ice cream sundae" breaks and "Secret Study Breaks" (students who found the secret break location within 15 minutes of the announcement were rewarded with free snacks). It was after witnessing the success of the pet therapy study break at Emory's MacMillan Law Library in the spring of 2012 that the team decided to have one at the Woodruff Library. Woodruff Library presented this canine event for the first time last December. The response was overwhelming; every slot was filled for the six hours Canine Assistants was on campus. In order to allow more students the opportunity to participate, the library team has expanded the event to two days. The service dogs are raised and taught on an 18-acre farm in Milton, Ga. Part of their training is to participate in a wide variety of outings that range from presentations for schools and community groups to therapy visits at hospitals, so they will be comfortable and calm in a variety of environments when they are placed with a recipient. Melissa Loree, director of education for Canine Assistants, says that participating in Emory's study breaks provides a wonderful opportunity for the dogs to gain such experiences. "It's a learning opportunity as well as a chance for us to give back to our community," Loree says. "The dogs are so loving and have such a calming effect that it's easy for them to make a huge difference even if just for a few minutes, especially during a difficult time like exams. It's a way for us to bring a little bit of ‘tender loving care' to Emory students during this stressful time."